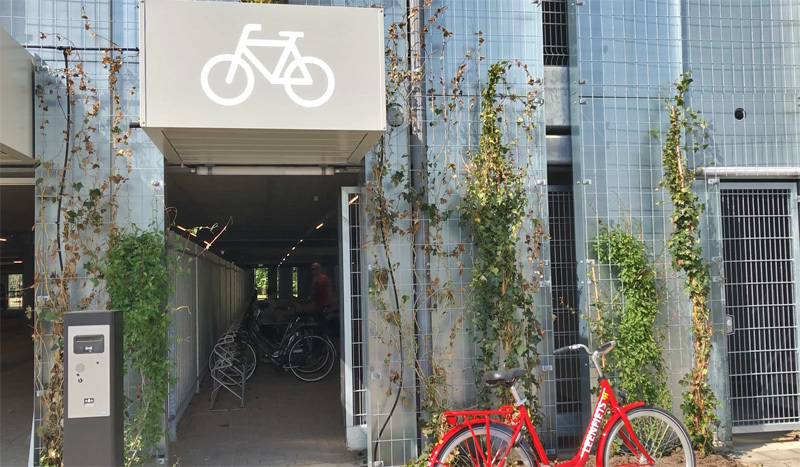 Some of you may wonder why I would show you a car parking garage on my blog about cycling in the Netherlands. But cycling isn’t a goal in itself. This blog is much more about creating a liveable environment and cycling can contribute to that. Every now and then, I show you other factors that may also help to make a city much more liveable. This post is about such another factor. For over a decade, ’s-Hertogenbosch already had three large “Transferia”; car parking facilities at the edge of the city with a bus service to get to the centre. They were the topic of the second half of one of my older videos. There will always be people coming to a city by car for whatever reason, especially from rural areas, further away, without good public transport. One of those three parking lots was only a temporary facility, to be used until this new parking garage was finished. The new garage can also be used for people visiting the hospital or people wanting to visit the nearby nature reserve. 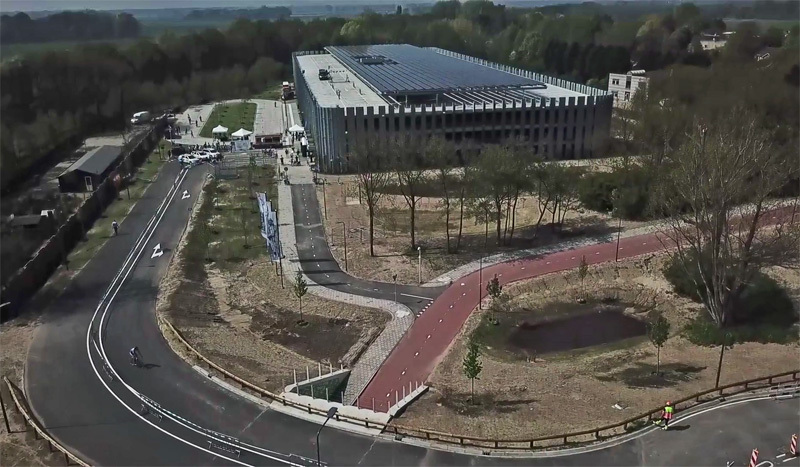 When the fast cycle route to Vlijmen was built, in 2012, one short bit was missing, because it was already known, at the time, that this large parking garage would be built here (my blog post). In 2012 the city didn’t want to build cycling infrastructure that would have to be changed completely, relatively quickly after it would have been built. 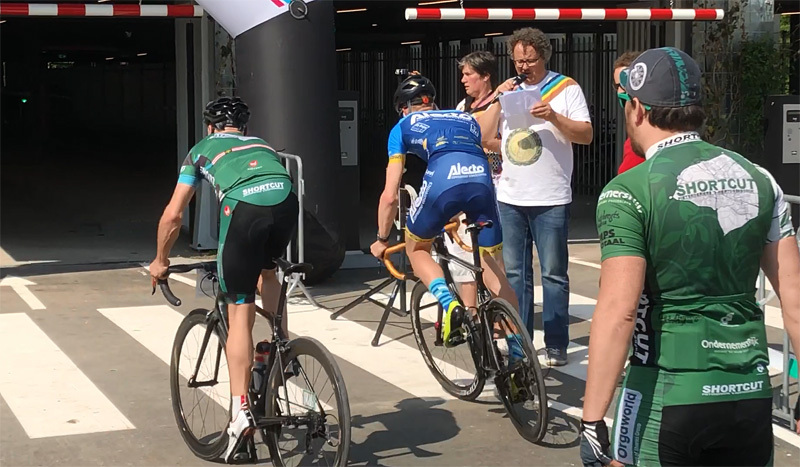 One of the handbikers rides over the new bicycle tunnel after the race. That road is now only for motor traffic. Part of the parking garage is for bicycles, 240 bicycles. On the wall the ivy that needs to grow and in front of the building one of the bicycles that you can borrow – for free – to get to a place in town where the buses do not take you. Or you can take the bike just because you prefer it. The city asked many stakeholders; residents, the hospital, a gardening society that had gardens here, an organisation for innovative green solutions, the local branch of the Cyclists’ Union and some other (recreational and nature) organisations, to give their opinion in the planning phase for this facility. It was the city’s intention to build the greenest parking garage in the country. Litteraly; the building will be covered in ivy, but especically by making it a sustainable net-zero-energy building with a relatively low negative influence on the ecology of the location. Necessary, because it was built at the edges of both the city and a protected nature area. The location was chosen right next to the main road around the city, so that no new large roads would have to be built to reach it. 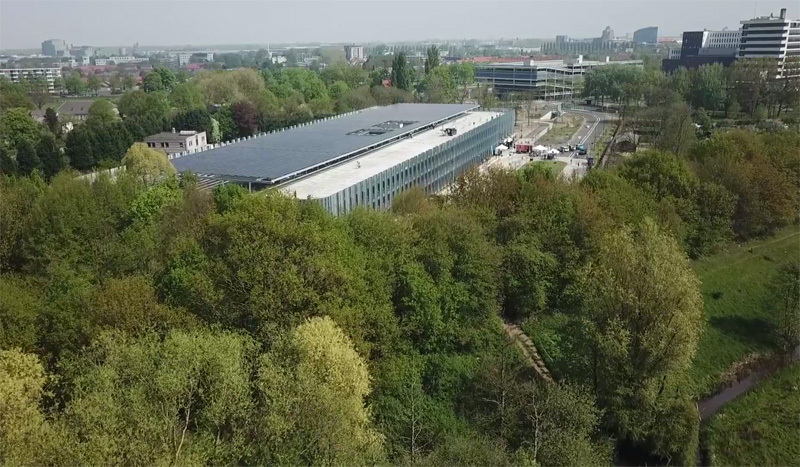 The building has 1,500 solar panels on the roof that generate more than enough energy for the building itself and for electric cars that can be charged in the garage. The buses, which are used to take people to the city, will also be electric (from next year). The bus fare (for four persons) is included in the day-fee to park your car here, which is €4,=. Buses go every 10 minutes (or every 20 minutes in quieter times) and take about 8 minutes to reach the city centre. The opening times given are the entry times and the times the buses are in service. The facility is open 24/7 to retrieve your car. The facility is financed with the total parking revenues in the entire city. Meaning that people choosing to park in the city’s facilities in the centre, at much higher costs, finance this facility. No local taxpayers’ money was used. The total investment was 16.9 million euros, of which 8.4 million for the building, the rest for the infrastructure and redesign of the surrounding area. The European Union gave a subsidy of almost half a million euros and the province of Noord-Brabant 8 million euros. Commercial parking garage operators in the city centre accuse the city of unfair competition, they claim the city did use taxpayers’ money to offer parking at much lower prices than they can. They went to court over this, but the city is confident the judge will rule in the city’s favour. In the bicycle parking area of this new garage. Just single tier racks. Very different from the dedicated bicycle parking garages I normally show you. There was a lot of attention for the surroundings of the parking garage. Not only will the outside of the parking garage turn green once that ivy starts to really grow, many new trees and plants were planted as well. Also species that weren’t here before. These trees and plants will help insects and small animals to find new sources of food. Special “bee hotels” were put on the outside walls of the garage. Made from reclaimed wood from trees that had to be removed for the garage. The ‘hotels’ should offer bees a good place to nest. Just from looking around you can already see that the landscaping is of an exceptionally high quality. Integrated in the landscape is a Wadi, a water storage facility that prevents valuable and clean rainwater from flowing directly into the sewer. Instead it is stored in the area to be used in dryer times. The new entrance road to the parking garage and one of the two new bicycle underpasses in the foreground. The turbo-roundabout is out of sight even further in the foreground. Still from a video by the city of ʼs-Hertogenbosch. The infrastructure was also adapted. With 1,100 parking spaces a lot of motor vehicles will have to be able to reach the facility. There already was a large parking garage for people working in the hospital. This meant the access road from the circular road to this location had to be widened for all the extra cars. The road was raised, so that the existing main cycle route that would cross the new entrance to the parking garage is now in an underpass. The existing level crossing, where the main cycle route crossed the entry to the hospital’s parking garage, was also changed into a multi-level crossing. Meaning a second new underpass had to be built. They were designed to match the existing underpass that was built when the south circular road around ʼs-Hertogenbosch was upgraded. I showed you that tunnel in one of my earliest videos in 2009. Since there are two garages now and one main access road, a raised turbo roundabout was built where those traffic flows split and meet again. With the motor traffic flow and the cycle traffic flow on a different level without any interaction, there is no longer a barrier to create a high-speed cycle route via Vlijmen to Waalwijk passing this location, which is in planning at the moment. 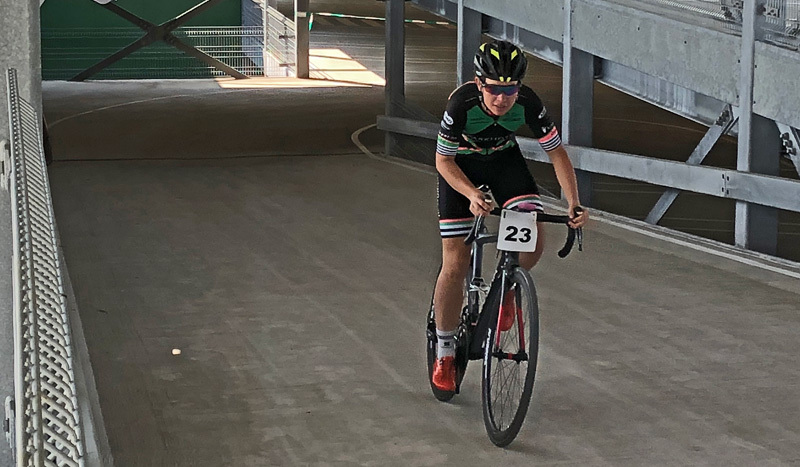 Racing to the top of the parking garage in a mock “mountains classification”. A bike-fest was organised on the opening day, Sunday 22 April last. People from around the country came to race to the top floor of the parking garage. Since that involves three inclines of 11%, the race was dubbed the “mountains classification of ʼs-Hertogenbosch”. The winner of the mountains classification in the Tour the France gets to ride in a white jersey with red polka dots. 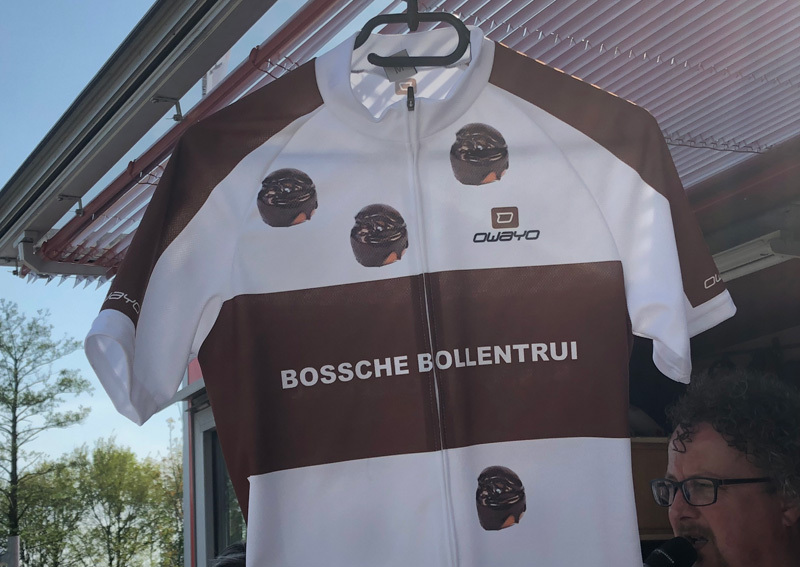 In this case those polka dots were replaced by “Bossche Bollen”, round chocolate eclairs filled with whipped cream, a well-known local sweet speciality. There were races for men and for women and also for people using handcycles. Spectators could also have a look around in the new facility that was open to park cars from the following day. Three such inclines of 11% to get to the top floor. Most riders did that in under one minute. The Dutch call the polka dot jersey, that the winner of the mountains classification in the Tour de France wins, “bolletjestrui”. Here a play on words with the local sweet speciality “Bossche bollen”. Leading to “Bossche Bollentrui”. 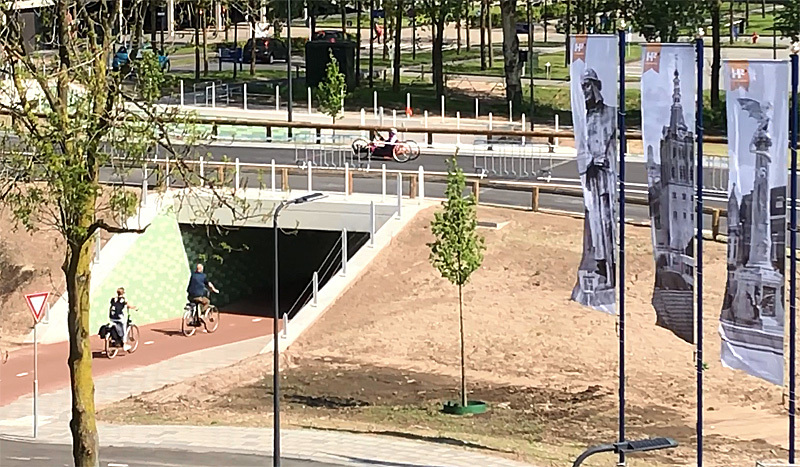 The city of ʼs-Hertogenbosch is very proud of this facility that the city feels will help improve the livability of the city centre, without being too much of a burden on the location where it was built. In any case, cycling is not hindered at all by these facilities, thanks to the two new cycle underpasses. And having 1,100 cars fewer in the city will make a difference! Video about the new ‘Transferium’ of ʼs-Hertogenbosch. Video ride. Cycling past the new Transferium before and after it was built. Thanks Mark for being so circumspect in your coverage of cycling infrastructure of the Netherlands by including car infrastructure. Your advocacy for cycling is apparent, but you are very fair to other modes of transport too. So much of the “advocacy” in the Washington, DC area, simply revolves around who is getting more money out of any one particular project: drivers, cyclists, transport users, pedestrians, residents, non-resident shoppers, commuters, etc.? It would not matter if a new parking garage would have large benefits for pedestrians and cyclists, simply spending more on drivers would be enough for lots of advocates to oppose anything like the Transferium. Great post, but also would be interesting to see the map with the locations of these ‘Transferia’ and the bus lines. Most tramways (in towns that had them in the first place) have been replaced by buses because they are cheaper, more accessible and more flexible in route use. In the larger cities in the Netherlands, there are still bus lines converted to trams, albeit slowly. A tram has twice the carrying capacity of a bus, and even higher boarding/leaving speeds. Den Haag has recently expanded its network, Utrecht is building a new tram line to the university, Amsterdam will build a new line to Uithoorn and likely convert bus line 15 to a tram line, Rotterdam is researching tramlines through the Maastunnel and over the Willemsbrug. 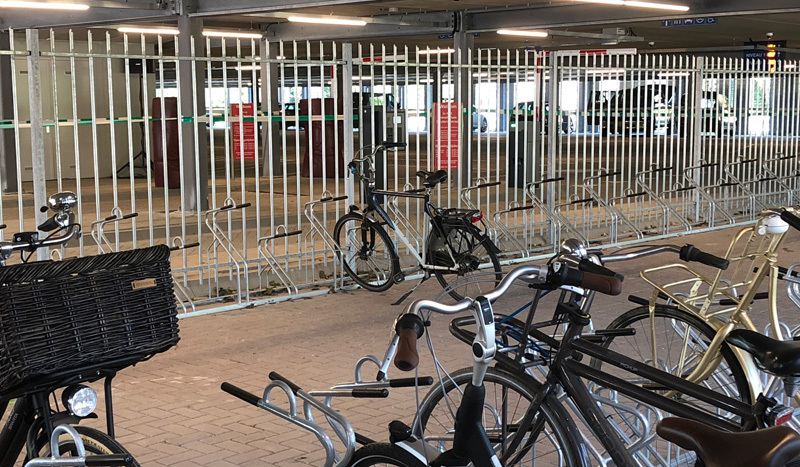 This entry was posted on 1 May 2018 by Bicycle Dutch in Original posts and tagged ’s-Hertogenbosch (Den Bosch), cycle parking, urban planning.